Made for princesses and queens alike, the Belle Fleur is a beautiful, sparkly gold tone accented crystal tie-back headband. It is made with a string of floral shaped crystal rhinestones surrounded in gold tone metal that measure approximately 12 inches long and 9/16" at the widest part. It is attached to 3/8" double faced satin ribbon. The satin is then heat-sealed to prevent fraying and ensuring an absolute perfect embellishment to any attire on your special day. This is an amazing photography prop. 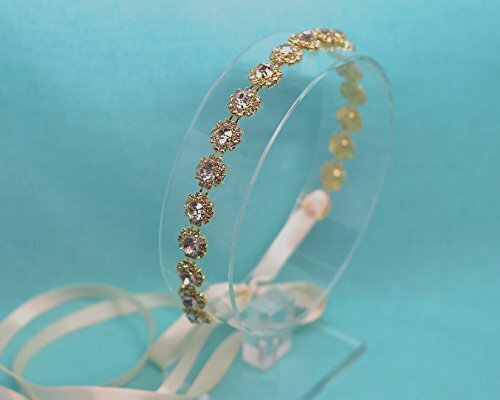 This Gold tone headband would be beautiful for a flower girl, bridesmaid or the bride herself. Crafted with attention to detail, your headband will be packaged with loving care in a box to ensure it will arrive to you in perfect condition for your special occasion. This piece is a true winner at an amazing price! If you have any questions about this product by The Ivory Willow, contact us by completing and submitting the form below. If you are looking for a specif part number, please include it with your message.